An advanced, luxurious cream rich in extracts that help promote re-texturized and brighter looking hands*. 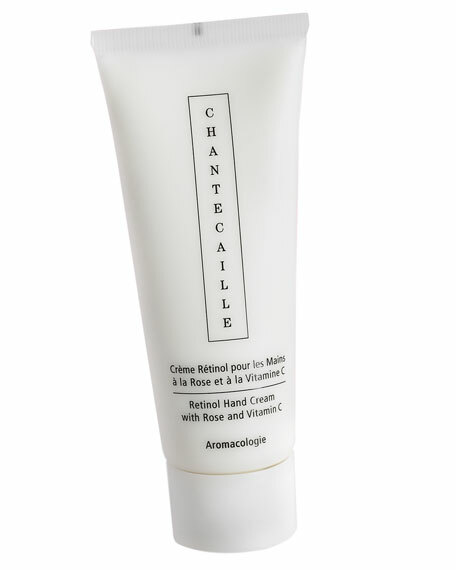 Encapsulated Retinol and Chilean tree bark extract support more even and younger looking skin*. Infused with powerful antioxidants. Massage daily onto the hands, cuticles and wrists. Retinol containing products are not recommended for pregnant women or nursing mothers. Pure Retinol encapsulated in botanical microspheres promotes re-texturized and firmer looking skin*. Chilean Tree bark Extract works to reduce the visible appearance of discoloration for a more luminous looking complexion*. Vitamin C (from fresh oranges) and encapsulated blend of vitamins A and E are powerful antioxidants for younger looking complexion. Mulberry Root is rich in soothing elements and is said to promote a more even looking complexion. Shea Butter is softening and moisturizing. Saccharine Isomerate acts like a water magnet helping minimize dryness*. Edelweiss Extract a wild mountain blossom is a powerful antioxidant and is allotted soothing properties*. Jasmine/Narcissus/Mimosa possess nourishing and skin softening qualities. 89% naturals, including an uplifting base of pure rosewater.